All-plastic construction won’t chip, rust or dent Fits under standard desk height even when swing-top is fully extended. Great for conference rooms, registers, admissions, display rooms, gift shops, housekeeping, offices, shops, and more. Rolled rim adds strength and is easy to clean. Made in the USA. 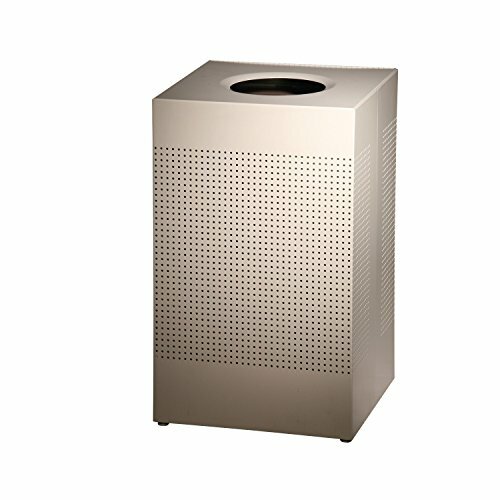 Rubbermaid Commercial FG295700BEIG Deskside Wastebasket, , Large, Beige. The sleek lines and graphic pattern of the Designer Line Sillhouette collection meet the needs of modern interior design styles. Perforated heavy-gauge steel receptacle is fire safe. Uni-Koat powder-coat finish is durable and resists corrosion and rust. Leg levelers offer stability on uneven surfaces. The sturdy piano-hinged lid makes it easy to empty. The leak-proof rigid plastic liner and folding retainer bands hold poly bags neatly in place.